Here’s the thing. 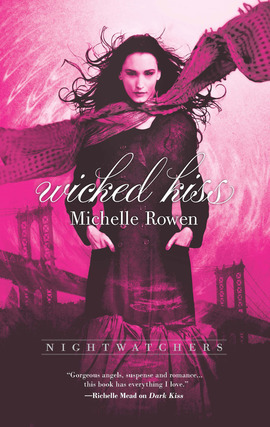 Wicked Kiss has a lot of my usual annoyances when it comes to Young Adult novels. There’s insta-love, secrets everywhere, lack of communication…it’s all there. And yet, Rowen was able to write all of that so amazingly well that none of it bothered me, at all. I was completely in love with this book. It starts off not long after Dark Kiss ends. Sam still hungers for Bishop, the angels and demons are still working together to get rid of the greys in Trinity, and they are searching for Sam’s soul. An angel with a secret agenda falls and becomes part of the group. It’s then discovered that the greys are changing–they either wither completely away, or they become super-greys. Sam is just as strong as she was in the first book. She doesn’t let anyone walk over her or tell her what to do. She is constantly trying to figure out things on her own, not succumbing to any “damsel in distress” moments. She fights her hunger, fights against the soulless being everyone is waiting for her to become. Bishop was wonderful. This might sound strange, but I love that Rowen wrote their relationship filled with questions. Are they attracted to each other only because Sam took part of his soul, or is it something more? It made the insta-love work for me. It made it questionable until the end. The plot was fascinating. Not only does the storyline from Dark Kiss bleed over, but it has its own plot to flesh through. At first I thought it might have been too much to fit into one novel, and man, near the end I had no idea how Rowen was going to be able to finish, but every word was completely worth staying up until 3am for. Wicked Kiss is a superb novel that has a little bit of everything. Rowen has a real talent for making my heart bleed for these characters and I can’t wait to read more from her. Her Nightwatchers series is a definite must read. Thank you to HarlequinTeen and NetGalley for an advanced copy of the novel in exchange for an honest review. This entry was posted in Something a Little Different, The Must Reads, Young (and New) Adult and tagged Fantasy, Michelle Rowen, Must-Reads, Paranormal, Seriously...You Must Read This, Young Adult.